The shoulder joint is an intrinsically an unstable joint held in place by muscles and ligaments. The price of a superb range of movement is that it is liable to dislocation. This can happen spontaneously in laxity of the tissues but more commonly is due to an injury during sports etc. In most instances the shoulder is relocated back in place but damage can occur to ligaments/muscles etc that can result in further problems. Generally, younger patients have a higher the chance of the shoulder dislocating again. Re-dislocations can occur with trivial trauma and the more the number of dislocations the easier it comes out. 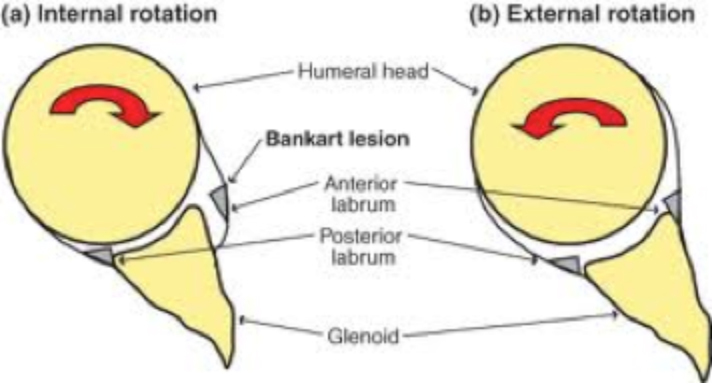 Damage occurs to the bone on the socket (Bankarts lesion) and the arm bone (Hill Sach’s lesion). If the dislocations are frequent or troublesome then surgery is the best way of correcting it by Labral repair, SLAP repair, if damaged. If the bone is significantly damaged then a Latarjet procedure has a very high success rate. Other procedures to tighten the capsule may be necessary at the same time. Additional problems due to damage to the Rotator cuff tendons or Labrum may be necessary too. The superior labral attachment of the biceps tendon is particularly vulnerable and may require to be repaired (SLAP repair).